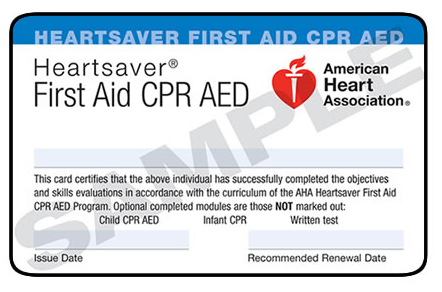 The American Heart Association Heartsaver First Aid course provides basic first aid and safety skills, equipping individuals to recognize and provide basic first aid care for injuries and sudden illnesses. You’ll learn how to identify and care for a variety of medical emergencies, including severe bleeding, shock, musculoskeletal injuries and other sudden illnesses, as well as how to reduce the risk of disease transmission while providing care. Please note this class DOES NOT include CPR. If you need to take a CPR AED training class, please click here. If you need to take a First Aid and CPR AED training class, please click here.